Sometimes you want to be dapper and vintage but you also want to have easy access to all your favorite handhelds. Whatever is the well-dressed techie to do? 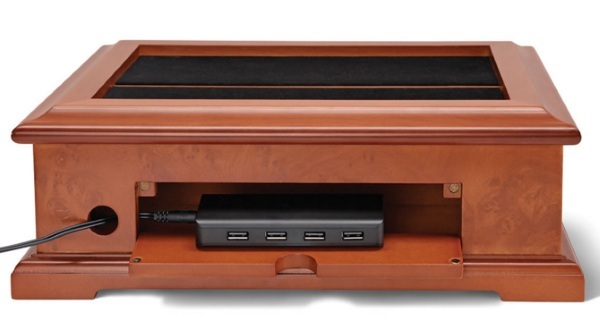 Invest in the Gentleman’s Device Charging Valet, the charging dock for the smartly dressed man. Men don’t have jewelry boxes. They have valets to stick their watches, cufflinks and whatever else they need to keep organized and close at hand for their busy gentlemanly lives. This one has four USB ports ready and willing to keep your devices ready for any adventure you have planned. The device itself is plugged into a standard outlet and can be used for charging phones, tablets, or any other USB device. It is wooden and has a built in stand for tablets and the like as well as a drawer to hold all of your valuables like watches and wallets. When not in use, it’s an attractive box so as not to mess up your vintage style. The Gentleman’s Device Charging Valet is $149.95.